"You cannot survive without that intangible quality we call heart. The mark of a top player is not how much he wins when he is winning but how he handles his losses. If you win for thirty days in a row, that makes no difference if on the thirty-first you have a bad night, go crazy, and throw it all away." There still remains a large population of stubborn “fish” in the developed world, who are clinging on to hopes of an economic recovery like incredulous poker players cling on to hopes of winning all their money back by playing three cards to a straight or a flush. These are the people who continuously get their clocks cleaned and then reload their chips in a vicious cycle of defeat; the people who keep the game alive and profitable for the “sharks”. At the same time, the bankrolls of fish have been diminished so severely and their egos bruised so badly that an increasing number are simply being forced out of the game for good. They can no longer ignore the fact that their lofty expectations have been flattened into silver dollar pancakes, and that they may find themselves lacking food to eat the next day if they continue gambling with what little wealth they have left. “It's only when the school of fish stream towards the exits in unison that the "game" becomes wholly unprofitable for solid players. Until that tipping point arrives, our bets will continue to scream "I have a monster!" at the top of their lungs, and the fish will continue to make crying calls in stubborn disbelief. The psychology of fish always leads them from a state of comfortable wealth to one of utter destitution over time, as they incessantly chase their losses, throwing bad money after even worse money. In the financial investment world, anyone still speculating on rising share prices through “buy and hold” strategies, for example, would be labeled a huge “fish”. A fish could also be a country such as Croatia, who recently decided to become a member of the EU in 2013. That was a classic move of “chasing” losses, or throwing good money after bad. After being downgraded to nearly junk status by Standards & Poor a year earlier, and struggling to achieve any economic growth whatsoever, Croatia panicked and stubbornly decided that its best play would be to shove the remainder of its chips into the middle of an imploding European Union, scurrying for the last deck chair on the Titanic. The most striking example of fish remains the rabid consumers of the developed world, who still feel the need to trample each other during the Holiday season for some sense of short-term gratification. They draw down their savings and run up their credit cards at a time when their jobs could evaporate at any moment along with the value of their assets and retirement accounts. So while there are still quite a few individuals, corporations and countries harboring the stubborn psychology of fish, it’s also clear that fewer and fewer people and entities can afford to remain in this category – i.e. we have most likely reached the “tipping point”. The point where there are no longer enough naive fish for the cut-throat “sharks” to feed on. A shark is a solid, patient player who immediately assesses the playing styles of his opponents when sitting down at the game, and uses that information to pounce on every single situation in which the shark has a mathematical advantage. The shark is out to maximize value and profits like everyone else, but typically realizes many of his/her own limitations and does not hesitate to sit on the sidelines, patiently waiting for opportunities to strike. The sharks also have a variety of tools at their disposal, including multi-layered deception and misinformation (something Bill Gross, the notorious financial shark, is familiar with) and an ability to make accurate probability assessments rather quickly with any given hand. Despite all of these advantages, even the most cunning sharks still share one fatal flaw – they are addicted to the game and refuse to quit even as the game collapses in on itself. The #1 reason the sharks lose money in the medium to long-term is not because of bad luck or better opponents, but rather they beat themselves. They lose patience with bad players, they let their ego get the best of them against good players and they start to take unnecessary risks with their bankroll. It could start off with small mistakes, such as getting into large pots with other players for the sole purpose of “out playing” them with weak hands, i.e. bluffing them off of the pot. These mistakes simply snowball on top of each other, as the inevitable losses pile up and the players begin to doubt their ability to remain patient and win. Eventually, the losses and frustration build up to such a level that the good player feels compelled to move up in stakes and win some money back. So the player goes from, let’s say, a $500 max buy-in game to a game where one cannot play comfortably without a stack of at least $2000-$3000 in front. At this point, the formerly disciplined players have entered a self-destructive spiral of throwing bad money after good which they are very unlikely to escape from. In a game of poker, the sharks can either put all of their available capital at risk on one game, or maybe leverage that capital up a few times by borrowing from a - pardon the pun - loan shark or the local bank, but that’s really about it. The desperate sharks in the world of international finance, though, can take their self-destructive attitude to a whole different level of extreme. The highest stakes game in this world is obviously found within the shadow credit markets, where hundreds of trillions of dollars worth of derivative debt instruments are bought and sold between large institutional players. These games are established by the very largest players in smoke-filled rooms at the back of the speculative casino, and cannot be observed or regulated by any official exchanges. ”So why did the notional increase by such an incomprehensible amount? Simple: based on some widely accepted (and very much wrong) definitions of gross market value (not to be confused with gross notional), the value of outstanding derivatives actually declined in the first half of the year from $21.3 trillion to $19.5 trillion (a number still 33% greater than US GDP). Which means that in order to satisfy what likely threatened to become a self-feeding margin call as the (previously) $600 trillion derivatives market collapsed on itself, banks had to sell more, more, more derivatives in order to collect recurring and/or upfront premia and to pad their books with GAAP-endorsed delusions of future derivative based cash flows. Because derivatives in addition to a core source of trading desk P&L courtesy of wide bid/ask spreads (there is a reason banks want to keep them OTC and thus off standardization and margin-destroying exchanges) are also terrific annuities for the status quo. Just ask Buffett why he sold a multi-billion index put on the US stock market. The answer is simple - if he ever has to make good on it, it is too late. The description above almost perfectly captures the self-destructive psychology of sharks in action, as the game enters an entirely new phase of ridiculously high stakes and almost no margin for error. As the value of the shadow debt-derivative system implodes, the financial sharks are forced to throw ever-more leveraged money onto the table until they have nothing left, because the alternative is to simply quit the game and accept their current losses. Peter Tchir provides some clues into what kind of derivative bets are being placed when he describes “The Ultimate Trade”. It was recently revealed that many European banks have been selling large amounts of CDS insurance on the bonds of their home countries, while also buying large amounts of the sovereign bonds themselves. In essence, they are going “all in” on the bet that those countries will remain solvent. "But why would BSC be so willing to sell protection [on itself]? Well, the markets were very wide because of the fear that they would default. You sell as much protection as possible. If you default what do you possibly care? Your stock is wiped out, your job is gone, and your strategy is totally explainable to future employees. If you don't default all this massive amounts of protection screams tighter and you have your best year ever. No brainer for the firm, an issue for the market. So, why are French banks selling protection on France like it is going out of style? Why are Italian banks doubling down on Italy? Because if the bailouts work, it is free money. Huge tightening on top of the spread income until the bailout finally wins. If the sovereign defaults, is the bank really going to be around anyways? It is the ultimate trade. If you make money, you get paid. If you lose money you were screwed anyways." The reality, though, is that this dark place ends up being much more frightening that anyone could have ever expected. After it’s all said and done, we can be sure the bruised and battered sharks will be begging the Lord Almighty to return them to the place where they were before they decided to make their final stand. But life simply doesn’t work that way, and that’s why we find our economies and societies held hostage to a self-destructive global banking system. Reuters and Zero Hedge have recently cast some more light on the shadowy games played by the sharks of finance, as they examine the role of the “re-hypothecation” of collateral assets through a never-ending chain of large broker-dealers and banks. Boiled down to its most basic form (which is really all that matters), this process allows a single asset to be pledged as collateral for short-term loans an infinite number of times. In the shadow banking system, many of these loans take the form of “repo” transactions, where the collateral security is “sold” for cash with the condition that it will be bought back at a specified date and rate of interest. These Escher stairs of OTC transactions, in turn, allow the financial sharks to potentially create an infinite amount of leverage behind their speculative derivative bets. In this particular game, all of the big-name sharks gather in the City of London, where virtually no restrictions exist on how many times the same collateral can be “re-hypothecated”. 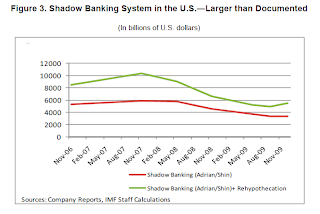 The following are excerpts and graphs from an IMF report prepared by Manmohan Singh and James Aitken entitled, “The (sizable) Role of Rehypothecation in the Shadow Banking System”, courtesy of Zero Hedge. ” The United Kingdom provides a platform for higher leveraging stemming from the use (and re-use) of customer collateral. Furthermore, there are no policy initiatives to remove or reduce the asymmetry between United Kingdom and the United States on the use of customer collateral. 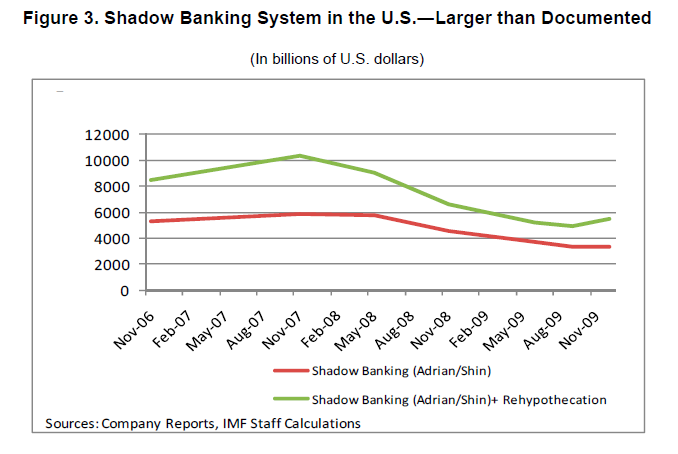 We show that such U.K. funding to large U.S. banks is sizable and augments the measure of the shadow banking system. … Rehypothecation occurs when the collateral posted by a prime brokerage client (e.g., hedge fund) to its prime broker is used as collateral also by the prime broker for its own purposes. Every Customer Account Agreement or Prime Brokerage Agreement with a prime brokerage client will include blanket consent to this practice unless stated otherwise. ”Following the collapse of Lehman, hedge funds have become more cognizant of the way the client money and asset regime operates in the United Kingdom. For some, the United Kingdom provides a platform for higher leveraging (and deleveraging) that is not available in the United States. In general, post Lehman, one would expect an increasing tendency for those providing collateral to counterparties to ask for their collateral to be segregated from the counterparty’s assets and to place limits on its further use. So, there you have it. The financial sharks are sitting down with each other in London to play one last game of incredibly high-stakes poker with infinitely leveraged capital, where absolutely none of them can afford to lose! Some of them will lose, though, and, when one or several major institutions do go down, it will become apparent that none of them really have the actual capital to back up their electronic chips. In a sense, that is what has already happened with MF Global, and the liquidity crunch was only temporarily stalled by the coordinated action of the Fed and other central banks. To see why, we can return to the original article by Christopher Elias on rehypothecation for Thomson Reuters. ”MF Global's bankruptcy revelations concerning missing client money suggest that funds were not inadvertently misplaced or gobbled up in MF’s dying hours, but were instead appropriated as part of a mass Wall St manipulation of brokerage rules that allowed for the wholesale acquisition and sale of client funds through re-hypothecation. A loophole appears to have allowed MF Global, and many others, to use its own clients’ funds to finance an enormous $6.2 billion Eurozone repo bet. As the institutional clients of brokers become increasingly fearful of having their funds effectively stolen through rehypothecation after the MF Global debacle, they will do everything in their power to make sure their cash cannot be further subjected to this process, which will only exacerbate asset sales to meet margin requirements, leading to lower valuations of toxic assets and more funding shortages at banks. ”The size of potential losses at European banks has scared away short-term creditors, squeezing the region’s lenders. The European Central Bank has stepped in to replace funds being withdrawn, providing unlimited cash and lowering requirements on the quality of collateral it will accept. Basically, the amount of actual capital available for the pot continues to rapidly shrink, while the sizes of the outstanding bets and raises remain the same – a theme well-known to readers of The Automatic Earth. The central banks are trying to hold back a tsunami of margin calls that will produce waves of potentially infinite height, and therefore there is no way they can hold them back for very much longer. As llargi outlined in his post, Cash for Christmas, the funding situation for European banks remains dire despite the coordinated CB swap lines designed to lower the short-term cost of borrowing dollars, perhaps because there is a massive shortage of euro funding as well, and there is very little chance it will improve. What is truly frightening about these financial sharks is that their predictable psychology ends up being much more destructive to the rest of society than to themselves. In a poker game, the sharks playing recklessly outside of their bankrolls will self-destruct, go home in tatters and perhaps drink themselves into a coma. In the game of high finance, though, the sharks will be bailed out and/or go home with much their personal wealth intact, after the institution’s shareholders, creditors, employees, customers and just about everyone else associated with it is wiped out. The sad fact is that we are all currently a part of their reckless poker game, whether we like it or not. There is only one way around that - the people must force their governments to hold the bankers criminally, civilly and financially liable for their actions and losses. If that doesn’t happen very soon, through whatever means necessary, then the only other option is to insulate yourself from the fallout through whatever means you are able and willing to undertake. The long journey from the casino back home is well underway, and now we must simply make it to that home, safe and sound. *Price rate can be changed at any time. If your mobile device cannot load the articles due to length, please try downloading the free, but powerful Bolt Browser.